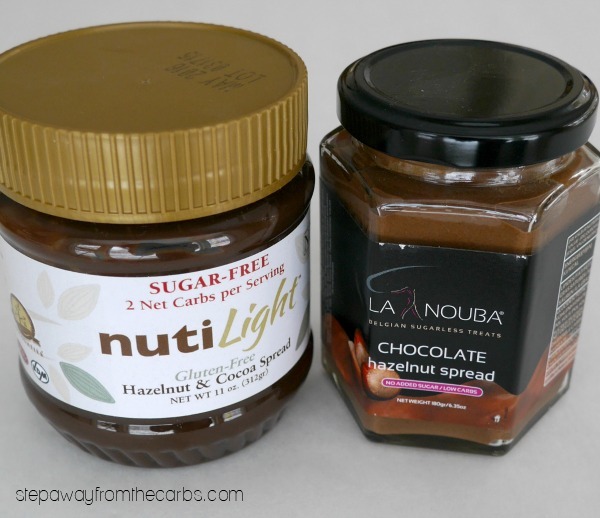 This is a comparison and review of two low carb chocolate hazelnut spread products. 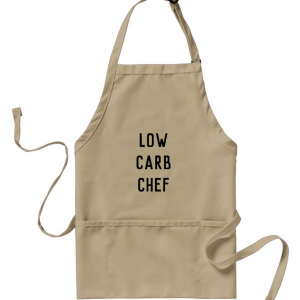 So let’s start with carb content and ingredients. 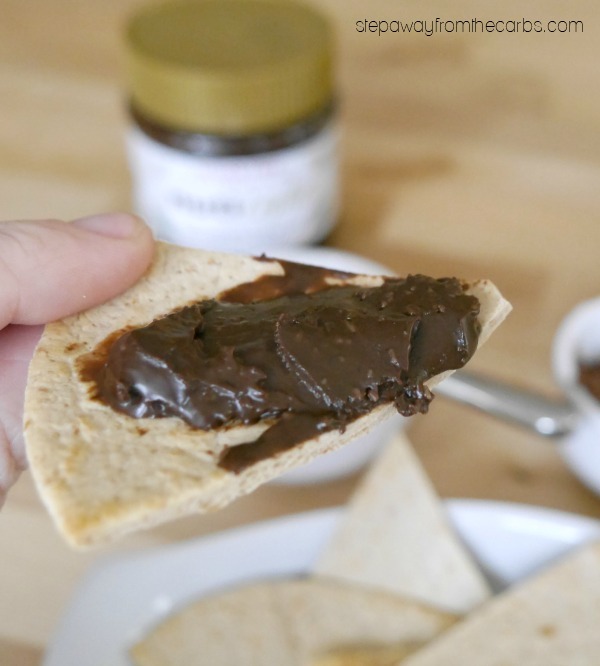 The first five ingredients of NutiLight are Chicory dietary fiber, palm oil, erythritol, hazelnut, cocoa powder. This looks very different from La Nouba, where the first five are vegetable fat, hazelnuts, maltitol, cocoa mass, lactitol. 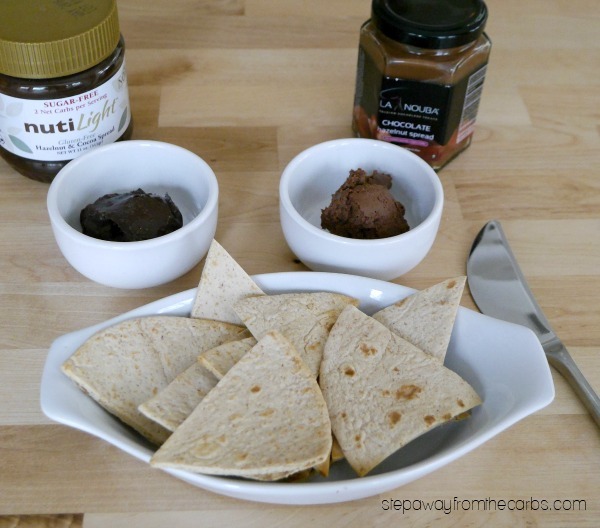 While I don’t like the idea that La Nouba contains more fat than anything else, I do like that hazelnuts are the second ingredient! 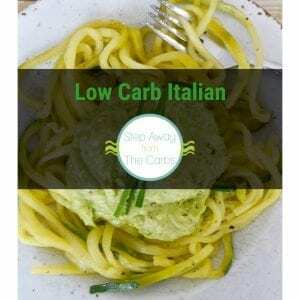 La Nouba is made by a Belgian company, so the nutritional data is listed in the European style (where fiber is not included in the carbohydrates – see my explanation on net carbs for more information!). Serving size is 17g, approximately one tablespoon. This contains 5.4g carbohydrates, of which 4.7g are polyols (sugar alcohols) and .22g is sugar. 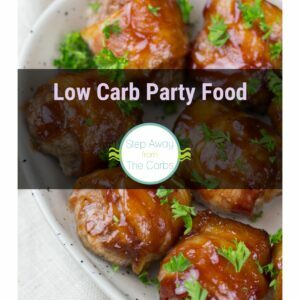 They list the net carbs as 0.5g per serving, so if you don’t count sugar alcohols on your diet – this is very low! 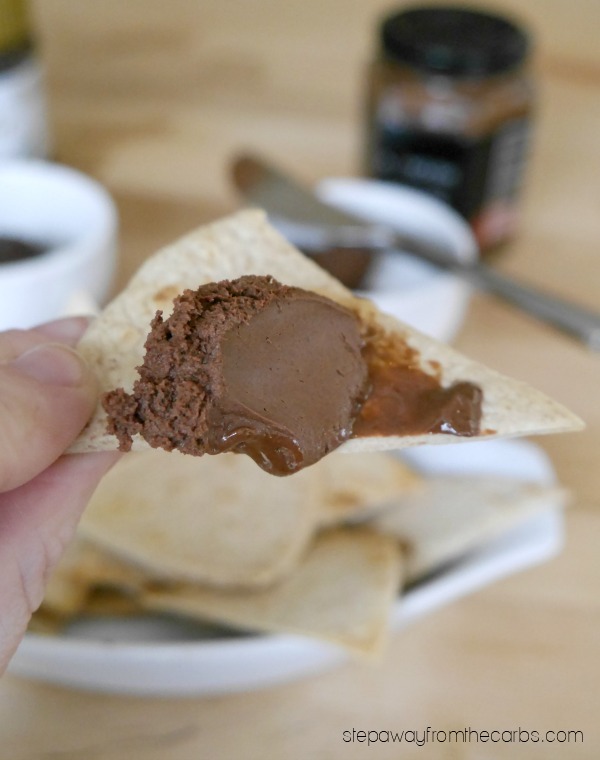 NutiLight is more straightforward – other than the serving size is 32g (two tablespoons)! So for the purposes of comparison I have halved the figures on the nutritional data: 9g carbs (total), 5.5g fiber, 2.5g erythritol. So if you don’t count sugar alcohols then net carbs are 1g per tablespoon, if you do include them then net carbs are 3.5g per tablespoon. And now for the tasting! I made some plain tortilla chips under the broiler (using the same method as Cinnamon Chips, but no additional flavors added to the tortillas) and got ready! The NutiLight was darker and denser, with a pleasing consistency. Good strong flavor. The La Nouba was very different – lighter in color and almost foamy compared to the NutiLight. Very soft and spreadable. Flavor-wise both were very good – neither of them were interchangeable with Nutella, but they are great alternatives. Choosing between them is probably down to preferred consistency and ingredients. 2018 Update – I’ve added two more products!! 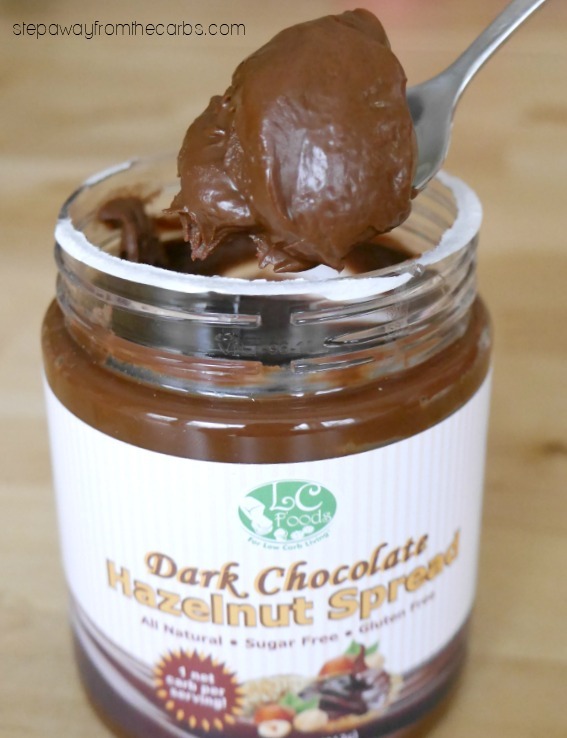 First is the dark chocolate hazelnut spread from LC Foods and I love it! It’s 1g net carbs per serving of two tablespoons (or 5g net if you count sugar alcohols). Check it out! And the second is a Chocolate Hazelnut Syrup from Nekstella. It’s really thick though, so you could definitely use it in place of any of the spreads. 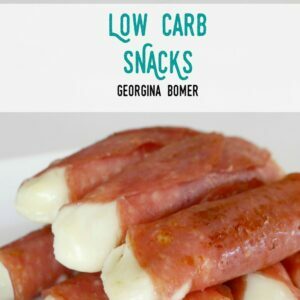 I received mine in a box of goodies from The Keto Box (lots of great low carb snacks, check them out!) or you can buy it from Netrition! 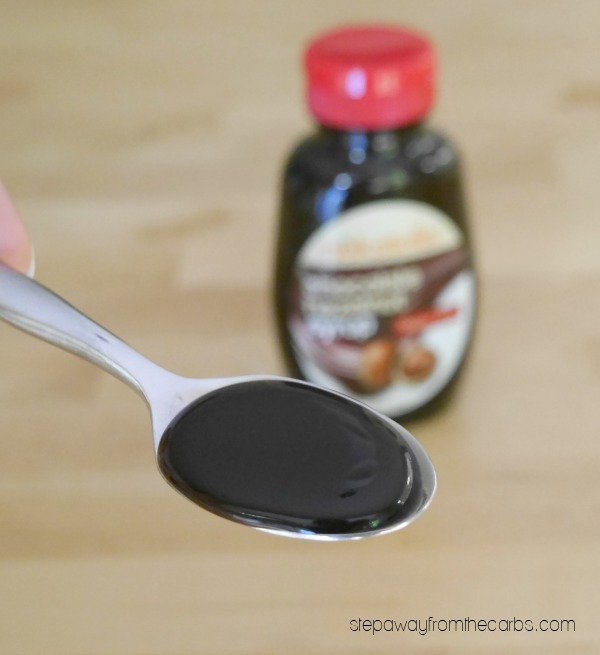 It’s 4g net carbs per serving of two tablespoons, and it’s sweetened with monk fruit. Yum! 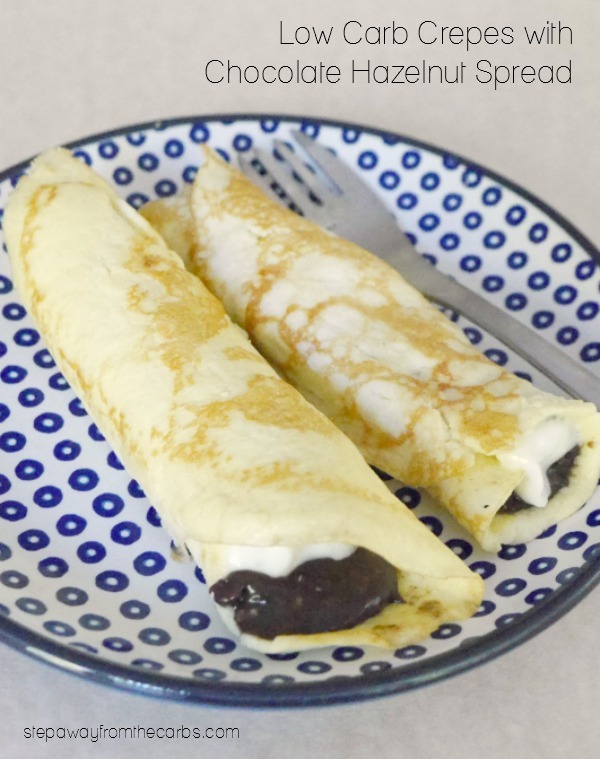 Try your favorite spread in a low carb crepe with whipped cream! The only sugar alcohol that causes me – um – issues – is maltitol, so I tend to stay clear of that. Everyone is different but moderation and sticking to serving size is usually a good way to start!